Some of the best travel destinations are simply too magnificent to be appreciated in a single afternoon. Others lie far beyond the harbors and bays that welcome cruise ships. But that doesn’t mean these places are out of reach for cruisers. Our new Cruise Global, Stay Local will let you leave the ship mid-voyage and spend two or three days immersed in the sights, sounds and flavors of some of the world’s greatest places. You can venture inland to uncover hidden treasure and explore less-trodden coasts. You can get more than a fleeting glimpse of bucket-list cities and linger at iconic landmarks. And then you can rejoin the ship and continue cruising. Better yet, these are inclusive experiences. One convenient package price includes transportation, hotels, meals and an expert guide to lead your intrepid travels. Each adventure is planned to perfection and concludes back at the ship to continue the cruise itinerary. You can enjoy Cruise Global, Stay Local in many of the most fascinating destinations around the world. Here are a few of the most intriguing experiences, in places where a little more time makes all the difference. Bagan was the capital of the first unified empire of Anawrahta, founded in 849 AD. Today it is the richest archeological site in Asia with more than 3,000 ancient monuments, temples and pagodas spread out along the mighty Ayeyarwaddy River. Needless to say, there is more than an afternoon’s worth of sightseeing to behold. Your first day in Yangon begins at a morning market, where you’ll be able to see what a typical daily routine is like for locals. After a full day of sightseeing, a horse-drawn carriage ride will lead you to a truly rare experience: enjoying a fiery sunset from the Sunset Temple, just as the ancients once did. Ruins that are beautiful during the day are even more spectacular under the magic hour glow. You’ll spend the night in Bagan and awake amidst history. Commemorate your experience by finding a souvenir at the famous Scott Market, which boasts a tremendous selection of handicrafts under its rustic roof. In Italy, the only thing that should be rushed is the fast train. Exploring some of the world’s most artful and culturally rich cities shouldn’t be a hurried experience. Your adventure begins in Venice, where you’ll set out by boat to St. Mark’s Square. Here, you’ll enjoy a guided tour of the Doge’s Palace. Climb the Golden Staircase, gaze up at the ornate carved ceiling of the Scarlet Chamber, and admire paintings by Tintoretto and Veronese. Then, spend ample time in the famed piazza, buzzing with artists and musicians, before touring legendary St. Mark’s Cathedral. 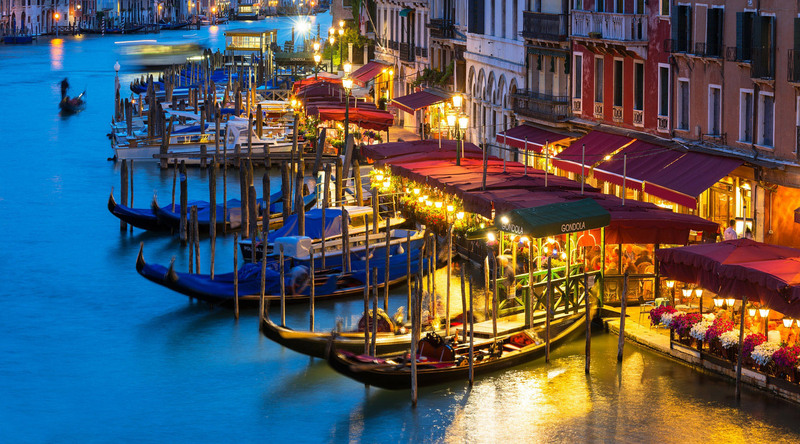 In the evening, you’ll have time to independently experience the wonders and flavors of Venice at your own pace. Enjoy a sunset gondola ride, dine al fresco in a bustling piazza, and stroll the quiet streets of Venice. You have enough time to do it all, or to do nothing at all – sometimes the best way to enjoy Venice is to sit back and watch the city go by. On your second day, you’ll take the fast train to Florence, where you’ll enjoy a guided walk through Italy’s Renaissance city. Florence is small, but mighty. There is so much to see, yet it is easily explored on foot. Witness the replica of Michelangelo’s “David” which dominates Signoria Square, and cross the Arno River to browse the shops of legendary Florentine jewelers. What could be better than two full days of embracing la dolce vita? Israel is replete with religious history and this two-day adventure allows you to retrace the steps of sacred texts. Your Overnight Adventure will begin in the biblical towns of Galilee and Nazareth. Your itinerary includes visiting the Mount of the Beatitudes, site of the famous Sermon on the Mount, standing on the banks of the River Jordon, and entering the ruins of an ancient synagogue. Your day will end in Jerusalem, where you’ll spend a wonderful night at a leading hotel. Awake on day two, rested and ready to explore the Old City. Stand before the Western Wall, the sole remnant of the Second Temple and the most sacred place among Jewish faithful. Visit the Church of the Holy Sepulcher, believed to enshrine the site of Jesus’ entombment. Tour the Israel Museum, home to the legendary Dead Sea Scrolls. Enjoy panoramic views of the Old City from Mount Scupos before venturing to Bethlehem to visit the Church of the Nativity. This Overnight Adventure takes you across the deserts of Oman for a once-in-a-lifetime Bedouin experience. You’ll begin with a 4x4 journey that winds to Wadi Arabayeen, a valley of deep blue waters and date palms. You’ll see the Bimah Sinkhole, a limestone crater filled with teal water, and stop for photos at Wadi Shab, a landscape of breathtaking lagoons, waterfalls and verdant natural terraces. You’ll stop for lunch at the Plaza Hotel in Sur, a coastal town renowned for dhow craftsmen who hand hew the graceful wooden ships. When you arrive at your Bedouin Camp, you’ll be greeted with a scrumptious Arab barbecue and fun-filled evening. Dance to live music. Get a henna tattoo. Take in the star-filled skies. At night’s end, you’ll retire to a luxuriously appointed Bedouin tent. After a great night’s sleep, the adventure continues. You’ll travel across the desert to visit a Bedouin family in their home and learn about their way of life. Later, enjoy a swim in the clear desert pool of Wadi Bani Khalid, surrounded by nothing but sand and sky. Go further. Stay longer. Discover more. Azamara's Cruise Global, Stay Local are experiences that go well beyond the bounds of conventional cruising. They provide a deeper connection with new people and places. They allow guests to go further, stay longer and discover more – yet another way Azamara goes the extra mile to deliver the finest experiences in cruising.